Forest Glade is a mobile home situated in a private woodland clearing. Spacious and well appointed, the home offers the chance to be close to nature with the convenience of modern facilities and home comforts. It is extremely private and you are literally in the heart of the woodland, overlooking the famous Lime Kilns (caves) and all of the natural wildlife. In the summer it is a perfect place to unwind while you sit outside with a glass of wine and a burger from the BBQ. Enjoy toasting marshmallows around your own private campfire whilst gazing at the clear starry sky. During the day enjoy making dens in the woods, playing garden games, and looking out for all the wildlife including foxes, badgers, deer and our rare birds. The home will sleep 2 adults and up to 3 children. Large living room and dining area, fully equipped kitchen with a newly updated modern bathroom with shower. Forest Glade is just 6 miles away form the Historic Ludlow. Other sites to see include the beautiful Berrington Hall (national trust), Hope Bagot village and Church, The famous West Midlands Safari Park, and Stokesay Castle. Forest Glade is in a secluded woodland location, so may not be suitable for guests with limited mobility or physical disabilities. Due to being in the Shropshire Hills, please be aware there are steep drops around the caravan - very young children must be watched at all times. Dogs are very welcome and Forest Glade for a small additional cost and MUST BE DECLARED BEFORE ARRIVAL. We only ask that they do not go on the furniture and their dirty paws are wiped before entering the home. An extra charge of £10.00 per dog is payable either via the website or in cash on arrival. Forest Glade has the benefit of a stunning log burner. We can provide you with a basket of logs, kindling and firelighters for £5.00. Please let us know before you arrival if you would like them so we can get them ready for you. Payment needs to be in cash on arrival. Only wood provided by Woodland Escapes can be burnt in the log burner. Damp and unseasoned wood can cause a chimney fire. All bed linen is provided for guests, however towels are NOT INCLUDED. Please be aware that this is a mobile home, with mobile home sized single beds. With this in mind please make sure that the size is suitable for your guests before booking. Due to remote location TV signal may fluctuate in adverse weather. DVDs are provided. We are a small family run business made up of three generations of very strong and ambitious women. There is Janet, my Grandmother, my mother Penny and myself, Fern. Whilst my Grandmother Janet provides the most luxurious and extravagant continental breakfasts the world as ever seen for our Bed and Breakfast accommodation Bowketts Wood, my mother works as an accountant for a local firm nearby and I run the business Woodland Escapes from home whilst studying to be a barrister. We love our home and wish to share it with guests to they too can experience the thrill of waking up somewhere breathtaking. Forest Glade, like all of our accommodation is unique because you are completely secluded in your own woodland clearing, surrounded by acres and acres of private woodland. There are no rows of caravans here - you have complete privacy. In addition you have have the freedom to build your own campfires and toast marshmallows, have a BBQ and explore the natural landscape that right on your doorstep. You can watch the natural wildlife from the comfort and warmth of our cosy mobile home that has had a recent refurbishment. We provide a stunning log bug burner for colder nights so you can snuggle up on the sofa with your loved ones and enjoy a DVD from our vast DVD library. We are also fantastic value for money. We want to share the love that we have for our home and its surroundings with our guests and we want them to experience the thrill of waking up somewhere breathtaking without the huge price tag attached. Ideal for a couples romantic break away or a family holiday. recently refurbished bathroom with modern sink, shower, bath and toilet. Log burner. Electric radiators in living room, bathroom, double bedroom and childrens room. Log burner. £5 per basket. Can be pre-booked online as an additional extra or paid in cash on arrival. Free parking, ample for up to 3 cars. Guests MUST inform us if there are more than 2 cars arriving on the premises as well as any other visiting guests. Bath mat and Hand towel provided. Guests will need to bring their own towels. Large living room area with sofas and puff and coffee table. One television in the living room with dvd player. Additional TV in the main double bedroom - FOR DVD's only. Due to the caravan being in the middle of the woods signal can fluctuate. Board games provided, garden games. Lots of DVDs available free of charge and on request. 8 acres of private woodland to explore. Host of rare plants, woodland creatures and birds. Due to secluded location not suitable for people with mobility problems. Guests should also be aware that certain areas such as the decking and grass may be slippy when wet so please take extra care in adverse weather conditions. A getaway from it all. We were all so happy to have a chance to relax and enjoy the beautiful surroundings. We ditched electronics and spent our time outdoors in the beautiful surroundings. Our own private woods! We explored this and discovered some real gems, including dens, camps, swings and a hidden glade. At night we sat around the campfire and toasted marshmallows. Bliss! The Caravan was a warm, clean and very peaceful place to retire to after a days adventures. We will be back! We loved it here. Definitely coming back. If anyone is expecting a luxurious state of the art caravan don't. the caravan is exactly as on the picture. basic but clean. But the area is beautiful. We stayed from the 6/8/2018 to the 9/8/2018 and never moved from our little clearing except to venture into the surrounding woods. We enjoyed being constantly in nature and watching the bats of an evening. It was lovely watching our granddaughter also enjoying nature. Thank you so much for this welcome break. We didn't realise how much we needed it until we actually stopped. Will definitely be booking again. great location although an old caravan the owners are doing their best to keep it up to date howver there are faults loose electric socket in bedroom no lock on toilet door bathroom plug didn't work couioldnt use oven or the BBQ and the most worrying is that the sewer system is overflowing into an open trench as it needs cleaning out. We are very happy that these guests appreciated the stunning location that Forest Glade occupies. 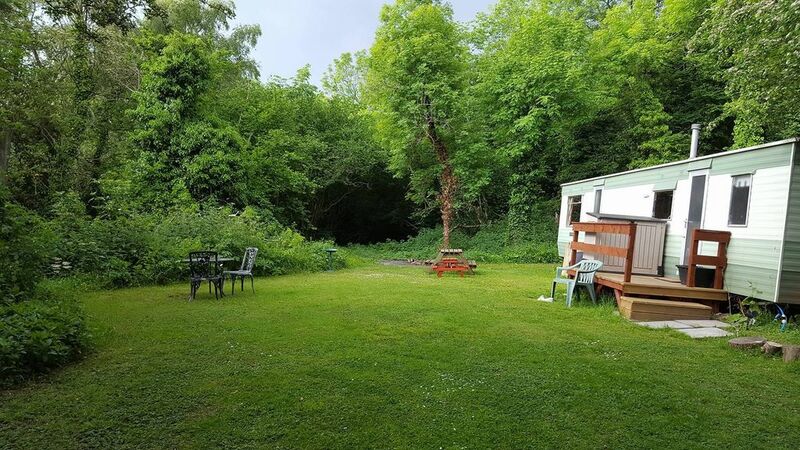 The guest is correct in that Forest Glade is not a new caravan - it is however up to date with all modern amenities including a fully refurbished bathroom. We are disappointed that the guests did not report to us that they did not know how to use the oven, even though the instructions are provided inside the home. We have no idea why they could not use the BBQ as it is relatively new and fully operational. The tanks at Forest Glade are regularly emptied - it is unfortunate that these guests arrived shortly after the freak weather conditions which rendered the surrounding area extremely wet. This was NOT sewage but waterlogged ground. We would also like to point out to these guests that they arrived with a dog which had not been declared or paid for. In addition they requested and were given extra bedding which they also did not pay for. We would encourage guests to seek out our other fantastic reviews on a host of different sites and judge for themselves. Would definitely recommend staying here . It’s so peaceful and quiet. The ideal spot to recharge your batteries and to unwind in total relaxation. Can’t praise highly enough. Everyone was nice pleasant and friendly from the moment we arrived till the moment we left. Will definitely be back.